As per the Hindu mythology the life can be managed in four segments, ideally a quarter of approximate lifespan should be associated with each. Brahmcharyashram – The age of learning. Gruhasthashram (or Grihasthashram) – The age to earn wealth, enjoy pleasures and live a family life. Sanyastashram – The age to live for the next germination and society altogether. Vanprasthashram – The age of detaching one’s self from the material stuff while keep finding answers to philosophical and eternal stuff and putting efforts to make the world better. 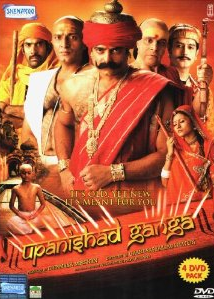 Episode #13 of Hindi TV Serial Upanishad Ganga talks about the first segment – Brahmacharyashram. As it the very initial stage of the life one should start learning. Actually the process automatically starts since the birth (to be precise, learning subconsciously is already started within the mother’s womb). In this segment one needs to keep learning and arm himself with the knowledge and skills which help him/her during the rest of the life. It is also the time when moral and ethical values and wisdom should implanted in one’s mind. This segment usually sets the attribute which will remain almost intact throughout the life. It is thus, very important phase of life. The ideal way to know something is learning it from the expert. That is why the schools are build. Also it is the age where one needs to be focused on his learning goals and avoid other temptations, that is why the Gurukuls came to the existence (modern day hostels are a form of it). The big question here is, should there be any bios about who should learn what? OR Does the society have the right to allow or prevent anyone from learning? Well, ideally, learning should be a birth right. Having knowledge and ability to pass on this knowledge systematically to the next generation is the unique ability of humans. But is it happened in real life actually? Well, we see that the social and economic situation of one, plays a vital part in his chances to get the quality education. Which it should not. The scholarships and other aids are invented to overcome such situations. But the social impacts are tough to overcome with! Take an example of Satyakam. He was a very brilliant kid who used to keep asking the questions due to curiosity. This habit make him the true seeker of the knowledge. His questions were logical and sometimes they were tough to answer. So he should get proper education right? Well, there was a problem! He was a son of a prostitute. As she have serve many people no one was there to give the father’s name to her son, Satyakam. Due to this reason, whenever Satyakam asks any scholar teacher to be his guru, he used to get refusal! Do you think it is injustice? Well, one guru thought the same and took Satyakam under his wings. He gave him the extreme knowledge he had. He made Satyakam to not to get ashamed of the facts of his life. And he asked Satyakam to add his mother’s name behind his name (like father’s name) and hence Satyakam is known as Satyakam Jabal (Satyakam – the son of Jabala). So it is the actual culture which consider male and female as equivalent, it is the culture which doesn’t consider one – untouchable – or even a step level or upper then the others, just based on the birthplace and family. If one has the will and ability, he/she should be given a fair chance to achieve his/her goal, that is the ultimate Hindu philosophy, and it is obviously the right one. The episode tries exploring the tale of Satyakam in summarised manner. And it does it effectively. The content should be key for such tales. Now as the actual tale is already there and known, the script writer needs to make it effective and presentable to the current audience. Same way the dialog writer have to make sure to write it in people’s language and yet convey the message properly. The episode excels in both the parts. The lighting, locations and wardrobe is the second attribute which add/subtracts from the authenticity of the episode. The efforts of the crew to get it done properly is clearly visible. And what more you need? Yes, the commendable acting. Most of the actors did justice to their role. However there are places where you could expect something better, but overall the acting is of quality. When the hymns are played and someone is just trying to lip sync to the same, it doesn’t look very effective. It is one of the downside of the episode. The first rate direction and background music makes it watchable for sure. The research team is also rightful owner for big applause. The DVD quality is good (for both audio and video). It is a recommended stuff to go for.